On November 10th, 2018 we celebrated Endeavor Miami’s Fifth Anniversary at our Annual Gala at Faena Forum. As we enter Thanksgiving week, we feel extremely grateful for what Endeavor Entrepreneurs have accomplished. Our gala was a night to celebrate and recognize their impact. A heartfelt thanks to all of our Board Members, mentors, sponsors and partners who help us achieve our mission to drive the South Florida entrepreneurial ecosystem forward. The evening started with a VIP cocktail with our co-chair Adriana Cisneros who led a fireside chat with the night’s honorees. 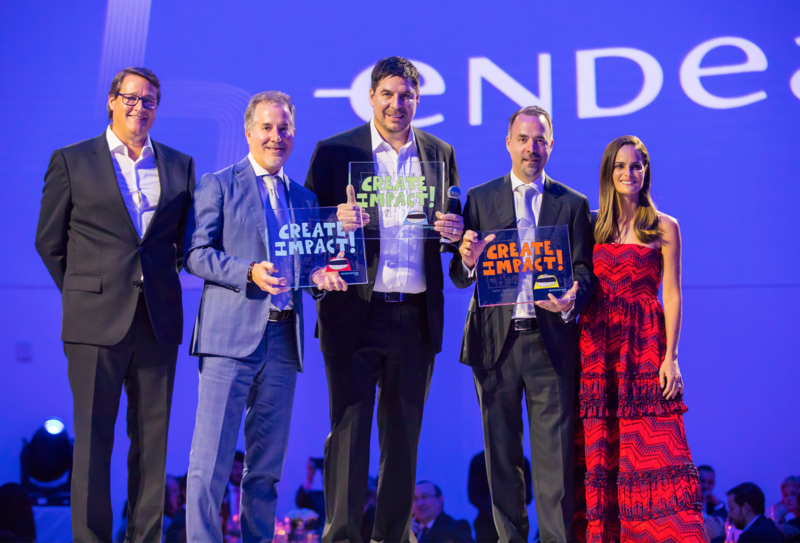 This year we honored three Miami leaders: Marcelo Claure, COO of Softbank Group and CEO of Softbank International, José Mas, CEO of MasTec and Jorge Mas, Chairman and co-founder of MasTec. 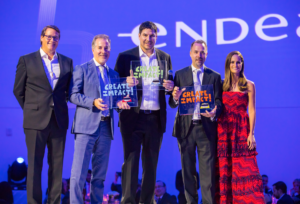 Together, they received Endeavor Miami’s 2018 Impact Award, presented by Endeavor Miami Board Members and Gala Committee Melissa Medina and Sean Wolfington. They received this year’s award for their entrepreneurial achievements and dedication as they challenge the limits of what is possible in Miami, as exemplified most recently by their MLS expansion efforts which will bring Miami its very own soccer team. Speaking to our guests, the honorees highlighted the pivotal role community building plays to drive innovation in our city. We were thrilled to also count with the participation of the Mayor of Miami Francis Suarez who spoke about the need to support high-impact entrepreneurs to scale, as a way to catalyze economic growth and job creation. The night was moderated by Endeavor Entrepreneur Johanna Mikkola. For the first time ever, we presented the “Endeavor Entrepreneur of the Year Award”, selected by a Board committee who took into account several criteria, not only based on performance but also on the impact and engagement the entrepreneur has within the ecosystem. We recognized one company in the brick and mortar space and another one in the tech sector. Proud to report that MyCeviche and Boatsetter were the first recipients of this award. Congrats to Sam, Roger, Jackie and Andy! Well deserved! We wrapped up the night at Faena Theater with a special performance from NYC DJ Hannah Bronfman! To those of you who attended, we hope you enjoyed your time at the gala! For those who missed it, we hope to see you there next year! We would like to thank our Diamond sponsors: Miami Innovation District, Simkins Family Foundation and Tony Tamer; our Gold sponsors: Bacardi, Citi Private Bank, Knight Foundation, YouTube, eMerge Americas, City of Miami, The Wolfington Companies and Nativo; and all of our Silver sponsors for their incredible support in building the entrepreneurial ecosystem right here in South Florida. We are excited to share pictures from the event with you! You can take a look here and here. We hope you had as much fun as we did. If you weren’t able to make it here is the recap video to make you feel as if you were there!